CSX - Winchester Lackey Jeff - misc. EK and CC Sub. On the way home from Lexington on Oct. 11, 2011 we stopped in Winchester to visit the antique mall. Instead my son-in-law and I headed over to Patio Yard for a few minutes. 1. 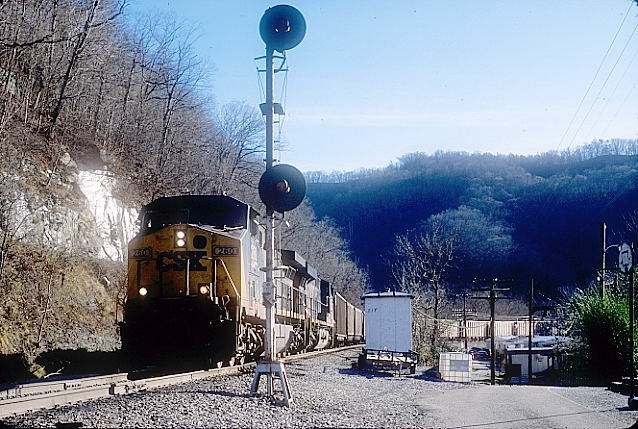 CSX 4758-4016-5335 southbound with manifest Q698 (Cincinnati-Hamlet). 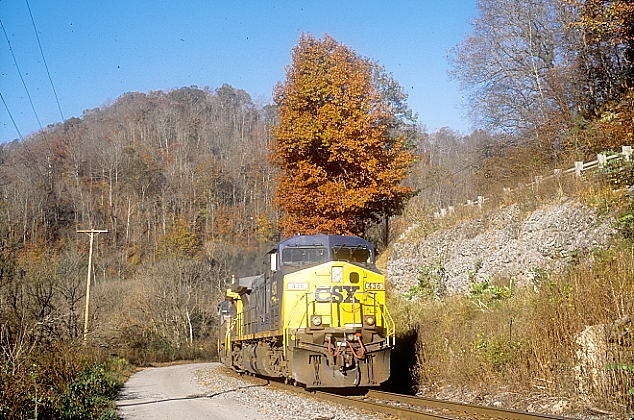 This train and its counterpart Q699 have often been running via the Big Sandy lately. 2. 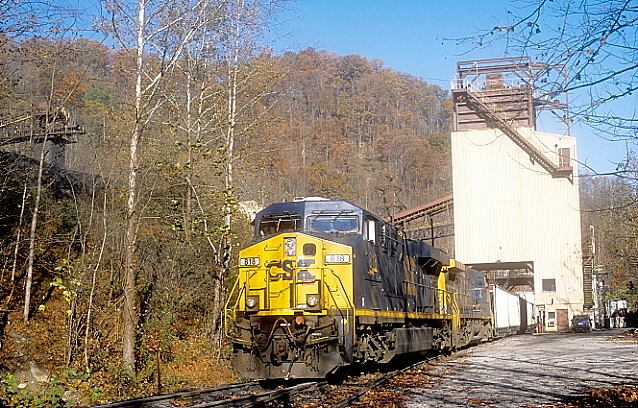 CEFX 3122-CSX 508-152 on a southbound grain train. The track on the right is the south leg of the wye leading to the EK Subdivision. 3. 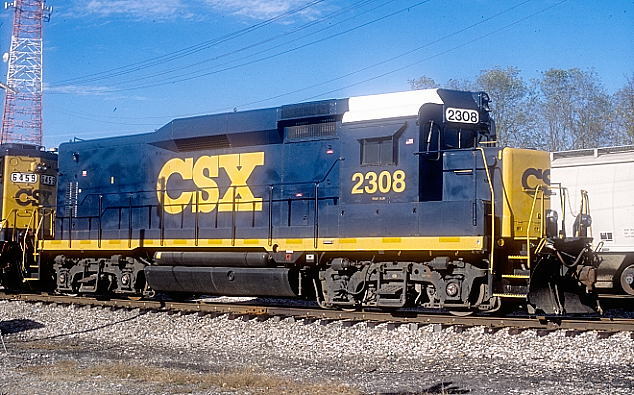 CSX Road slug 2308 parked in Patio Yard. GP30s will live forever! 4. 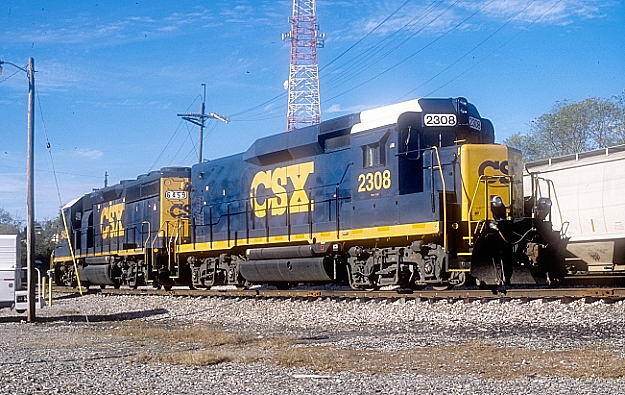 CSX Road slug 2308 and mother GP40-2 6459. 5. On Nov. 2, 2011 I took a day of vacation and headed to the EK around Hazard. Near Martin I overtook a CSX empty C842-02 with 436-54 and SCWX and ADLX cars. Just south of the KY 550/KY 7 intersection at Lackey he faced the sun, and I liked the copper-colored tree on the right. 6. I peeled off KY 80 at Hiner to check out the Sigmon mine of Frasure Creek Mining. 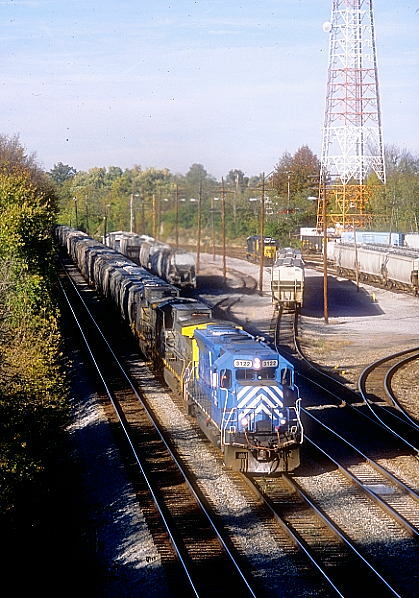 CSX 818-111 were ready to start loading KUCX (Kentucky Utilities) empties, but there was no crew on board. 7. I went down-river to my favorite spot at Perrett with hopes of getting a southbound to photograph passing the crossovers at Krypton. 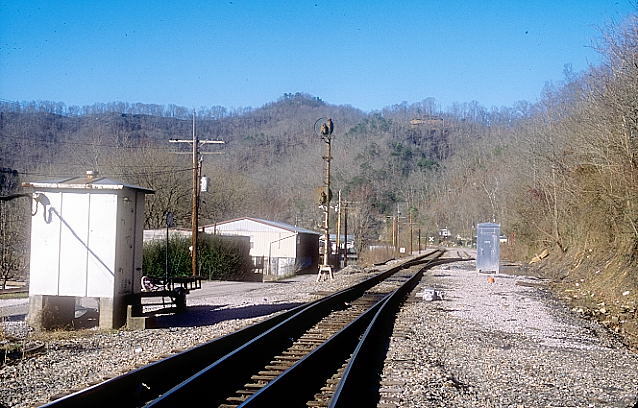 Perrett is the north end of a long stretch of double track that extends south almost to Hazard. There are CTC signals there, but they are approach lit. I hung around until mid-afternoon. Nothing approached and they never lit! Here's the location I wanted to get at Krypton. Nothing else was happening around Hazard, so I headed home. On Jan. 24, 2012 I headed back over there for more punishment. Same old story. Waited at Perrett until the sun changed at Krypton but no train. I decided to head the long way home following the Rockhouse Sub. to Deane. 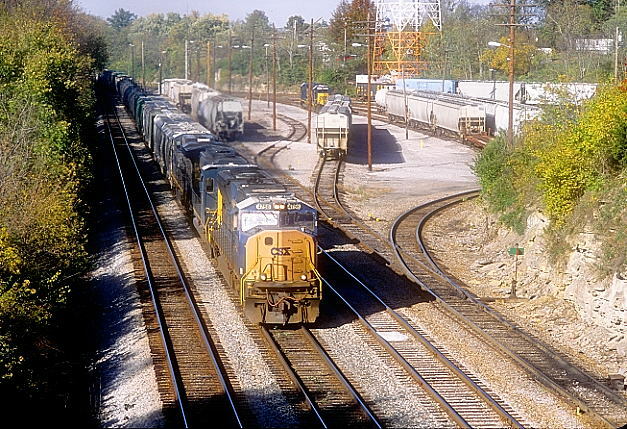 A northbound train was waiting near Jeff for maintenance equipment to clear up. 8. This view looks north at Jeff. The Carr Fork Br. comes in from the lower right. In the background begins the siding for Buckeye coal loadout which is a wye. 9. 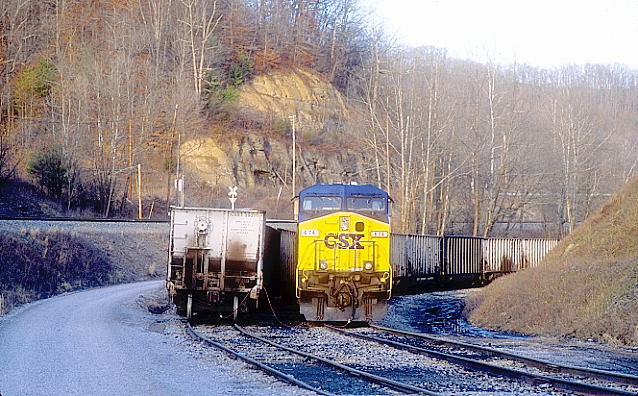 CSX 260-925 lead n/b C845-24 with SCWX, ADLX and BNBX empties toward Hazard. 10. The sun was beautiful, but the railroad was all quiet. At Deane I found 674-5014 parked on the west end of the load tracks of the Rapid Load mine with no crew. That's the former C&O E&BV Sub. on the hill on the left. 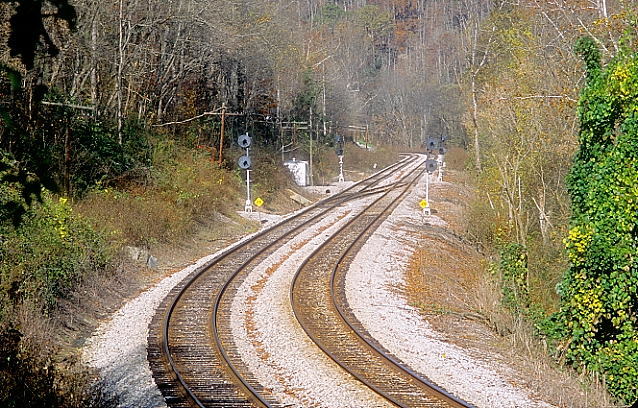 L&N's old load tracks were ripped out on the right after the merger.